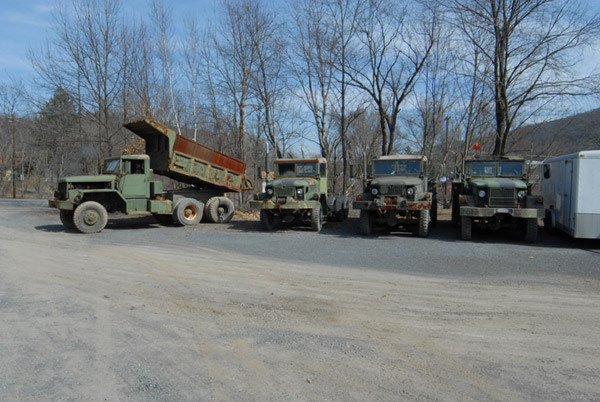 (2) 6x6 Military Flat Beds w/ sides for transporting material on site/generator tools, parts, etc. JLG Fork-lift 4x4 – 10,000 lbs. Fuel Trucks (Storage Tank) – 500 Gal. – 1,000 Gal. – 2,000 Gal. – 2,500 Gal. All are diesel and run good. Tires on flat beds and tractors are approximately 85% to 90%. Tires on dump truck are approximately 50%. All trucks have new batteries and topped off with full tanks. Cost $6,500.00 each Price can be adjusted with multiple purchases.